We Accept All Major Credit Cards. We Can Help To Provide Financing and/or Possibly A Leasing Option May Fit Your Situation Better. Give Us A Call To See How We May Better Serve You. Our Machines Support Both Polyvinyl and Wood Products. 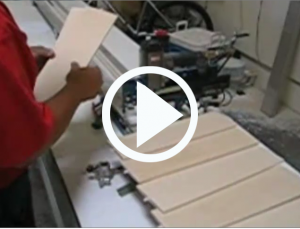 Watch the Video below as we walk you through the whole Window Shutter making process, from raw stock to finished product. Included here in our video are some of our machines we make that provide you with quality equipment you’ll need for your window shutter business. We show you the process from Your New Storage Racks to help organize your stock material. Your Rolling Carts to transport the material to Your New Framing and Assembly Table. Next you’ll see how to use Your New Louver Notching Saw, how the Drilling and Stapling Machine works, the Tilt Rod Radiusing Machine, Tilt Rod Stapler with Auto Advance, Rail Notching Machine, your Louver Tree Hanging Rack to hold your Louvers. Watch the accuracy of the Stile Drilling Machine with Auto Advance, Mouse Hole Routing Machine, and watch an actual assembly of a window shutter on the Panel Clamp Table with Double Moveable 66″ Jaws, and Rolling Panel Carts for your finished Window Shutters. With this complete line of Window Shutter making equipment, you can start producing a line of quality window shutters you’ll be proud of, and your customers will be proud to own and show to their friends, who may just want to order some too. Please call us and let us show you how easy it is to get started in the Window Shutter adventure. Call Us Now: 1.602.268.3938 or 1.602.616.6283.